Share the post "Take a Ride"
I wasn’t happy about this early arrival of the rain that wasn’t supposed to be here until Thursday. Oh well, it happened, and now the skies have cleared off, so hopefully it will start drying off. My entire morning was spent on a long drive to Eastern Iowa to meet with some people whom I’d made an appointment with early last week. I was hoping it wouldn’t be raining during that long drive, but unfortunately, I drove nearly the entire way back in rain. It felt like a big rush to get there and meet with them, but afterwards, I took a more leisurely drive stair-stepping my way home on back blacktops. I made sure to take my camera with me just in case I would see something worth sharing, and glad I did because there were numerous stops I made to take photos of views we don’t have around these parts. You do know we live in the “Flatlands”. What surprised me, was seeing many successful small town main street businesses booming, in even the smaller towns. When seeing that, it made me all the more sad that our Downtown doesn’t have that kind of civic enthusiasm in keeping the doors of locally owned shops open. I’m starting to believe there are too many of our residents that look only at prices, and more than willing to drive clear across town to save a dollar or two. Most times the things they buy aren’t even needed, and certainly not of enduring qualities. While in conversation with one of my colleagues today, I insisted there are too many people with top of the line appliances that have all those un-necessary bells and whistles. For example. Why in the world would two people who don’t do that much entertaining or cooking, own super-expensive stoves and refrigerators that have more buttons and controls than the cockpit of a Boeing 747? As far as I’m concerned, it’s all for status and show. If all the cubic feet of those monster refrigerators were filled with food, more than half of it would be spoiled before it would get eaten. My feelings about those super expensive stoves are likewise. Just yesterday I was showing a home that had one of them, and when looking at all the buttons and features, I said to the buyer, “Now really. How often in a year’s time would you ever put such features to use? She laughed and said, “Frozen pizzas only need a certain temperature for short periods of time.” When you look at all those already prepared dishes in the frozen food sections of our grocery stores, a 1950’s style stove would do the same job if not better than the new ones with all those gadgets which all have pre-planned obsolescence built right in. I learned some years ago that the warranty on a given appliance normally ends just before something very expensive to repair on it suddenly fails. I learned a valuable lesson when believing a new top of the line Maytag washer and dryer would last as long as my previous set which worked for years with zero service calls. Five years later, a very expensive lesson was learned with that worthless set. After the third after-warranty service call, I abruptly said to the serviceman, “Get rid of them because I’m not paying for anymore repairs!”. The reason I’m speaking about these things, is just a reminder to all of us how much society is being driven by needless consumerism. I see it on nearly a daily basis where people are buying new when there’s absolutely nothing wrong with the old. And what’s laughable is when someone proceeds to give me lame and even obscure excuses as to why their old went out and the new came in. Let’s face it, nearly all of us have been duped into believing newer is better. 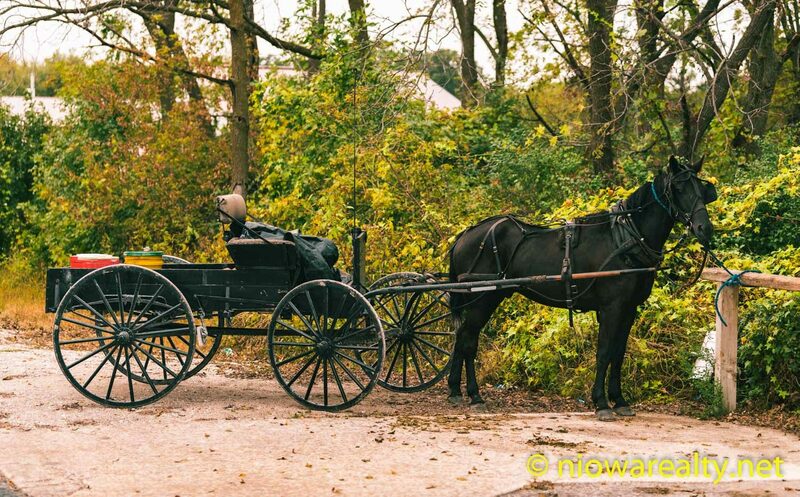 When I stopped to get gas at a little town near the border of Minnesota and Iowa, I was delighted to find an Amish or Mennonite couple pulling up in a horse-drawn wagon. I dared not take a photo of them, but did wait until they went inside to snap the above photo. If they didn’t have those boxes in the back, you’d swear I stepped back in time to take a color photo of their rig. What a great happenstance! I would’ve loved it if they would’ve been willing to let me take a short ride. Tonight’s one-liner is: People need to be cautious because anything built by man can be quickly destroyed by Mother Nature.